Hats off to Kevin Cleary who recently passed the French Wine Scholar exam & Sud de France Master-Level exam, both with a high score! 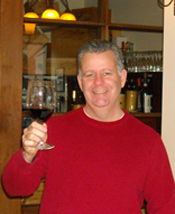 Kevin is the Founder/Director of the Vermont Wine School in Burlington, Vermont. When not teaching about, learning about or tasting wine Kevin works as the Chef/Co-owner (with his wife Kathi) of L’Amante Ristorante in Burlington. Kevin plans to offer the French Wine Scholar program through the Vermont Wine School beginning in 2012. “The French Wine Scholar program, and all of the programs offered by the Wine Scholar Guild, is the best, most comprehensive course of study for French wine, bar none. The program is well thought out and presented. Anyone wanting to learn about French wines needs to take this program; there is no better program out there."